The house is clearly divided into at least two partitions, with a few people looking out from the distant subdivision. 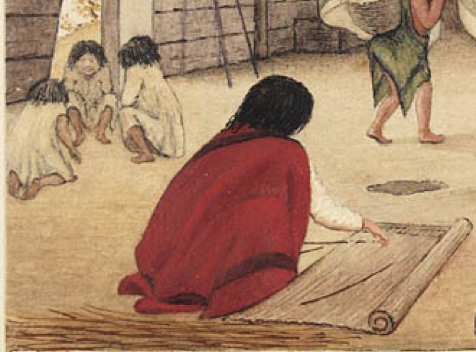 In the foreground, a woman is making a mat, apparently out of tule (cattail reeds) – compare to this historic photograph, or this one, or these Makah examples, and a nice picture of Snuneymux women gathering reeds. You can see the length of the mat needle she is using quite nicely. I don’t know what the paired long rods are to the left of the house but I wonder if it is a frame for a dipnet, like this fantastic example? I think the squared off timbers are also interesting, and something I generally associate more with the Columbia River — the Meier House had these, I think – at least down the middle. It could be that sawn lumber was becoming available, of course, by 1864. It is also nice to see the group of three children huddled together probably having a hilarious giggle. And intriguing to see how the walls – which would have been removable from the frame – do not meet up with the roof. I suppose the divided partition and the wall on the right would limit drafts, or perhaps seasonally people didn’t care too much. It’s an interesting point in time, with a mixture of trade goods and traditional manufacturing side by side. Maybe the raffle winners ended up donating their prizes! 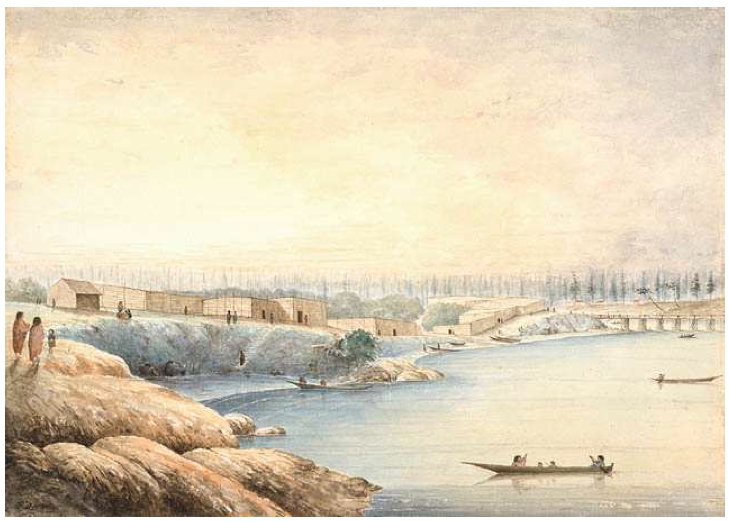 At the Provincial Archives, there are at least two paintings by him, one of William’s Lake, and another of Victoria Harbour, with rather poor reproductions on this page (hi RBCM, this is a research use….). However, I found a different online document here (PDF), from which I took the illustration below – this is actually an informal catalogue of the Winkworth collection, which includes those items in the National Archives such as the mausoleum and the interior views. I also note in that document it claims the Salish Mausoleum is in the Fraser Valley. Anyway, the view of Victoria is charming, apparently showing Laurel Point (and those McMurtrie gravehouses?) in the foreground, though I understand there has been an awful lot of landfill in that part of town. Edward Mallott Richardson: Victoria Harbour 1864. Source: “Digging for gold” pamphlet. Click to enlarge slightly. And, while we have the Digging for Gold pamphlet open (which has a lot of fun images in it), see the view below from 1860 of the Songhees Village in Victoria Harbour — this is approximately where the Delta Point Hotel is now I suppose, or the area just in Vic West as you cross from the Blue Bridge. Interesting the defensive sites in that area don’t really show. You can try aligning it all with the historic maps and dioramas here, or even these 1859 (!) photos of Victoria and Esquimalt – if the links still work. Well, probably we could spend a whole post picking this painting apart as well, but at some point this blog has to get back to archaeology, eh? 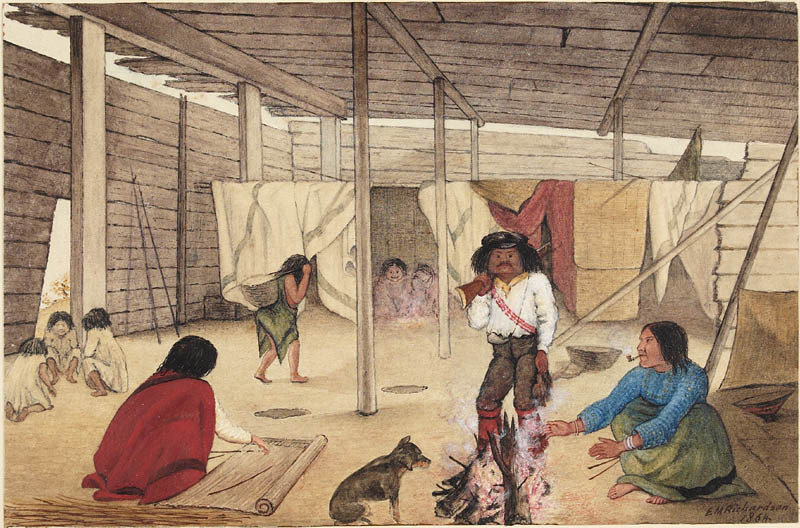 Edward Parker Bedwell Songhees Village 1864. Source: “Digging for Gold” pamphlet. Click to enlarge. This entry was posted in archives, First Nations, history, Northwest Coast, Vancouver Island and tagged art, Coast Salish, First Nations, household archaeology, longhouses, Salish, Straits Salish, Victoria BC. Bookmark the permalink. Quentin: Now here is an artist who emphasized basketry–including all categories–baskets, mats and hats. Looks like two large cedar bark mats hanging over the partition pole with lots of wool blankets between family areas–even shows the use of occasional black dyed elements in the checker weave to create geometric design. Speaking of wool blankets, another aspect of textiles would be the dog by the family hearth–if a wool dog it has recently been sheared (which is said to happen 2 times a year…..). The great detail to the tule/bulrush mat making is wonderful. I can interject some archaeology here since we found what appear to be 9 broken off tips of cedar matting needles at the Hoko River wet site where 26 fragments of sewn tule mats were recovered (Croes 1995:171-172). In our experimental reconstruction of these tule mats, using long cedar sewing needles and replicas of the mat creaser found, the tips would occasionally break off and new tips were carved at the end of these long needles. 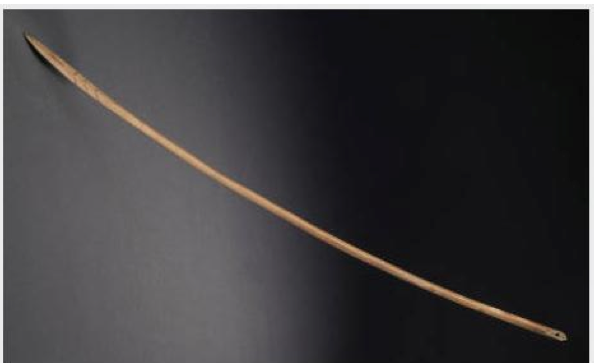 Undoubtedly, the long length of the needles was intended, in part, to allow breakage and resharpening before the entire needle needed to be discarded (like making long wooden wedges so broken tips could be resharpened until the wedge is exhausted). These sewn tule mats were important as mattresses, to cover temporary shelters at fishing camps (like the 2600-3000 year old halibut fishing camp at Hoko), to cover and protect canoes from the sun, seat padding, etc. Isabell Ides, Makah masterweaver and my teacher referred to tules as the “prehistoric foam rubber”! Since foam rubber really did not come into its own as a product until about the late 1930s, these mats were probably well in use until quite late. No doubt our Anglo term mattress comes from a time when mats were used in the past as bedding (though not sure why the female suffix -ress (like actress, waitress, princess, goddess). Possibly referring to these as usually made by women. Looks like a good 2014! Helen – thanks, you’re welcome. Dale – aren’t wool dogs supposed to be grey or white? That sure looks like a bog standard mutt. Interesting comment on the needles — suggests that drilling in the eye was the most labour intensive part? Richardson did a pretty good job on the hands in this picture so that can’t be the reason for the “hands in pockets” in the mausoleum picture. Apparently, mattress comes from the Arabic taraha “to throw” which morphed into Arabic matrah “carpet or cushion” and thencely to mattress. So actually not that far from “mat”. Quentin: I understand wool dogs were white, black, spotted, and brown–probably white was preferred, and breed for, but what probably really mattered is that they had good yarn hair quality, regardless of size too, which could be selected for from pups. Hi Felicia, I tend to agree with you with reference to Susan Crockford’s book on NW Coast dogs. I think the wool dog is meant to have quite a curled tail if I recall correctly, and this doggy looks like it is sitting on it’s mutt-like tail.